Can’t find Pappy Van Winkle anywhere? Here’s a bourbon that you’ll find on the shelf of virtually every decent liquor store, as well as some less-than-decent shops, in America. Bulleit Bourbon is in that nice sweet spot in the market, a step or two up from the bottom shelf. Prices vary from state to state, but you’ll likely pay between $20 to $30 for the 90-proof straight Kentucky bourbon. Owned by liquor giant Diageo, the high rye bourbon (the mashbill is just under 40% rye grain) was distilled for many years at Four Roses distillery. Because of growing demand for its own whiskeys, Four Roses recently stopped supplying Bulleit. Who exactly is making bourbon for Bulleit now is sort of a mystery. What’s in the bottles on shelves right now probably is still from Four Roses (at least in part) and probably aged at the famed Stitzel Weller distillery. Soon enough, Bulleit’s $115 million new distillery will be up and running and the mini-mystery of where the bourbon is made will go away. The nose on Bulleit has lots of sweet corn, light caramel, and oak with just the slightest floral aroma. It pours a light copper color and comes in its distinctive old style apothecary bottle. On the palate, Bulleit features light char, caramel, buttered corn bread, and honey. The finish shows off the rye spice and wood that lingers on the roof of your mouth. There’s no question in my mind that Bulleit Bourbon is a steal at $20 and it hangs well with the best bourbons under $30. You wouldn’t hesitate to use it in a cocktail, but its perfectly pleasant neat, which is how I prefer it. For a cigar pairing, Bulleit calls for a medium-bodied cigar with a little spice. I’d particularly recommend the Tatuaje Black, Aging Room F55, La Flor Dominicana, or My Father. 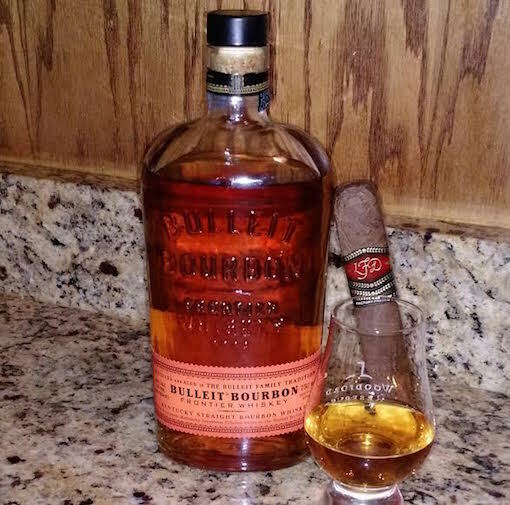 For all the hype of limited edition bourbons like Pappy Van Winkle and the Buffalo Trace Antique Collection (which are both outstanding), Bulleit is a reminder of what I like best about bourbon. You can still find excellent bourbons for a reasonable price and Bulleit just another example.